I realize that I must look forward to set new goals. Start over. Live out of and away from my past and grow from my mistakes and hard learned lessons. I am walking in a better version of my previous self. I may be scarred, and scared, but I keep going. Years ago, I was standing on a precipice, leaping towards a life filled with happiness, I fell into the fulfilling glow of a path marked with education, music, and creativity! I could not be a hero or a heroine if I had given up and not landed on my feet. my path could have gone any number of ways, but it was faith that brought me here. I didn’t know what would be on my path, but I believe we all have “things” that we carry, everywhere we go. If I glow, it is because of those gifts. If we glow, it is because we are carrying the same torch. Here I stand, looking back to see what I’ve learned and carrying my wisdom into new and different places. Am I afraid? Yes. Will I stop? Always to rest. Will I quit? No. I’ve had many perfect and serendipitous days. I know there are more in my future, and I’m reminded of those little blessings as I dust off old songs and tell my fans about new music. Each recording is a little gem, a story, a relic. I collect them everywhere. Enjoy “At Least I Stand” and get a glimpse of life, for me, a few years ago, when I had a little less, a little less knowledge, and a growing heart for passion and inspiration. I will continue to be inspired, to overcome fear. Passion is like a flame, contagious, and I carry it with my everywhere that I go. My first step was faith. I walked through those flames. 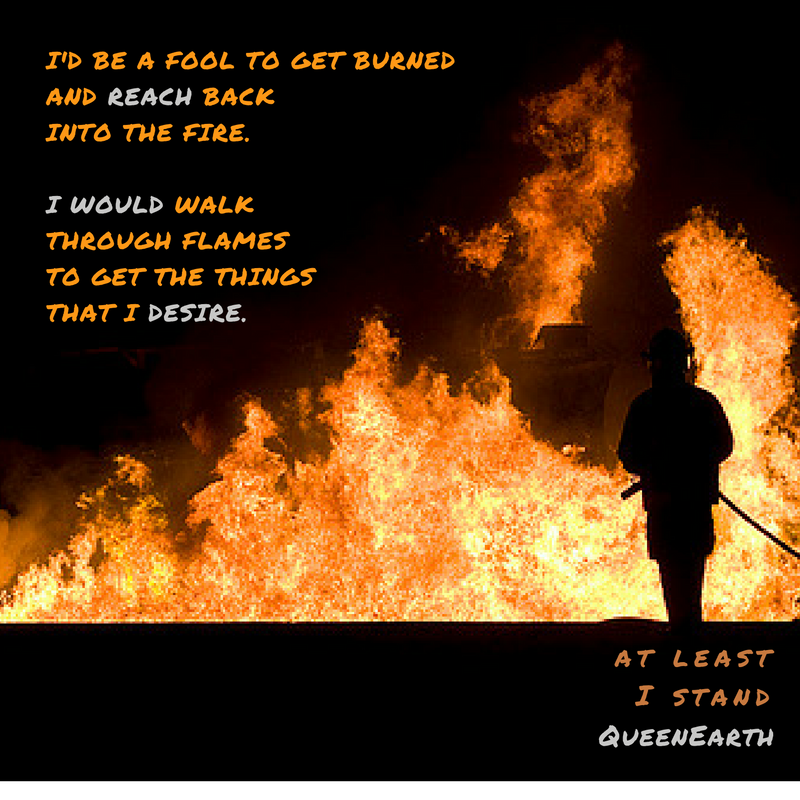 This entry was posted in QueenEarth and tagged at least I stand, coaching, creativity, education, fire, music, passion, public speaker, purpose, QueenEarth. Bookmark the permalink.